These forms can be filled in from your computer by typing in the blue text fields. Then print the completed forms and bring them with you to your appointment. Or you may print blank forms and fill them in by hand. If you need to have your existing records transferred to our office, please download and complete the form below by filling in the blue text fields. Then print the completed forms and FAX them to your previous eye doctor or bring them with you to your appointment. Click on one of the questions below to see its answer. How do we check your child's vision? How do dilating drops feel? What does a patient experience when his/her pupils are dilated? Why may I have to wait long to be seen? How do Atropine eye drops work? How do we use it? When do we follow up? What if the glasses don't completely straighten the eyes? When eye muscle surgery is necessary. I am an adult. Why am I being seen by a pediatric eye doctor? All ophthalmologists (eye doctors that are MDs) have formal training in children’s eye problems, and the pediatric ophthalmologist has had additional training and practice in examining children and caring for their medical and surgical eye problems. If your primary care doctor suggests that your baby or young child have his or her eyes checked, a pediatric ophthalmologist will have the greatest knowledge of the possible conditions and the greatest experience in examining children effectively. Pediatric ophthalmologists achieve the best outcomes for all pediatric eye problems. We test your child’s vision at distance and at near to the best of their ability. If your child does not know letters, we have standardized pictures the child can match that have a “20/20” equivalent. In preverbal children and babies, we are able to determine the vision using specialized instruments during the exam. Many parents are surprised that a complete eye exam can be performed on a child of any age. A pediatric ophthalmologist can evaluate how well a child can see based on the way a child uses his or her eyes to look at and follow attractive toys or lights. The pupil is the black hole in the center of the colored part of our eye that allows light into the eye. We use safe eye drops designed to dilate the pupils for babies and children. Young children usually need a dilated eye exam to accurately determine if they have a focusing problem such as nearsightedness, farsightedness or astigmatism. Young children’s eyes have a very flexible lens and will provide inaccurate measurements if glasses are needed. 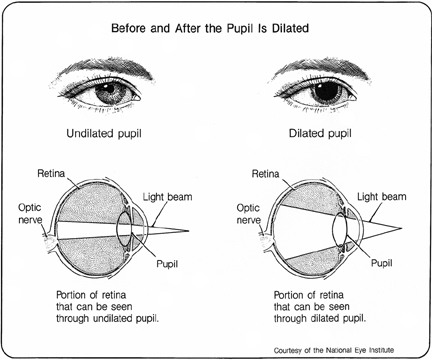 Dilation temporarily neutralizes the lens so we can get the most accurate prescription if glasses are required. Also, the internal parts of the eye (the lens, retina and optic nerve) are thoroughly evaluated after the pupils are dilated. Dilating drops feel like soapy water or swimming pool water in your eyes. The discomfort lasts only 2-5 seconds. Dr. Patterson and her staff will talk your child through the eye drops. An anesthetic (numbing) eye drop is given immediately before the dilating drop to minimize any discomfort. Though it is important to be honest with your child, we do not always recommend “warning” the child ahead of time about the eye drops or making it sound like it is a difficult experience. For some children, the anxiety created by thinking about the eye drops can be worse than actually receiving the eye drops. Vision will be blurred for several hours especially for seeing near objects. Most children return to school without difficulty as long as the teacher is notified that they may have trouble reading. The pupils remain large for 3-6 hours and rarely up to 48 hours in some light-eyed children. One eye may return to normal size faster than the other pupil. There are no permanent or lasting effects from the dilating drops. While the pupils are dilated, the eyes will be more sensitive to sunlight and we will provide disposable sunglasses at the end of the visit. We believe your time is valuable and we do everything we can to see patients at their scheduled appointment time. Dr. Patterson provides all patients with the time necessary to care for their medical and surgical eye problems and to answer their questions. We often do not know in advance which patients will require a greater than average time for their appointment. We will keep you notified if there is an unusual delay. Also, unexpected emergencies must be worked into our busy daily schedule. Amblyopia is the most common reason for permanent poor vision in one or both eyes starting in early childhood. Decreased vision from amblyopia (often called “lazy vision or lazy eye”) occurs because of lack of use during childhood. The brain is not processing the visual information from that eye. It is caused by any condition that interferes with normal visual use of the eye(s) such as strabismus (an eye that is not straight), refractive errors (strong or asymmetric focusing problems or glasses prescription), or anything that blocks the pupil such as ptosis (droopy eyelid) or cataract. Amblyopia can be treated during childhood by forcing the brain to use the weaker eye. Amblyopia in one eye often goes undetected because the child functions normally by using their good eye. Like strabismus (crossed or wandering eyes), amblyopia often runs in families and it is especially important that young children with a family history of childhood eye problems have a vision screening by 4-5 years of age. The earlier that amblyopia is treated, the more likely the child will have the best vision. Patching the good eye forces the brain to use the bad eye. The amount of time your child must wear the patch to recover vision varies depending on the severity of the amblyopia. Patching is usually part time from 2 to 6 hours a day. If full time patching is recommended for severe amblyopia, this means no more than one hour off per day. Follow-up visits occur every 1-4 months when a child starts patching. Once the best vision is achieved, patching treatments are gradually reduced over months to years to prevent a relapse of the lazy eye. The length of treatment depends on the type of eye condition causing the poor vision in an eye. Atropine works like patching, except that the eye drops dilate the pupil and blur the good eye instead of occluding it. It is often a second-line of treatment because patching the cooperative child is usually more effective. If Atropine is used daily, follow up should be in 1-3 months. Dr. Patterson will discuss the most effective treatment options for her young patients who have a range of personalities and tolerance for amblyopia therapy. Though most newborn babies have occasional eye crossing or deviations that go away by 4 months of age, some children are born with eyes that remain cross-eyed. Congenital esotropia is usually treated with eye muscle surgery in the first year of life to provide for the best long term outcome. Accommodative esotropia is another common type of eye crossing seen in children. The eyes cross when a very farsighted child makes an effort to focus. One or both eyes may cross, and esotropia may occur suddenly and be present all the time or only sometimes. It often begins between 9 months and 4 years of age and can run in families. This condition has been studied extensively over the last 40 years and pediatric ophthalmologists now have a good protocol to achieve the best long-term outcome for the child. Glasses correct the farsightedness to reduce the focusing effort and allow the child to see clearly without straining to focus. Within a few days of obtaining glasses, you will usually notice that the eyes remain straight (or straighter) when the child is wearing their new glasses. When the glasses are taken off, the vision is blurry and you will see the child’s eyes cross again. Sometimes the eye crossing seems worse than before the child got glasses. Now that the child has become used to seeing clearly all the time with the glasses, they are less tolerant of blurry vision. Without glasses, they will try to focus to reproduce the good vision they have with the glasses and their eyes cross. Surgery or patching may be necessary to eliminate any residual eye crossing that is not controlled when wearing glasses. The scientific literature has clearly shown that children with accommodative esotropia achieve the best long-term outcomes and vision if they are placed in accurate glasses quickly and receive surgery to straighten the eyes when necessary. Vision therapy (eye exercises) has not been shown to be an effective treatment for esotropia or most forms of strabismus. Some children will eventually outgrow the glasses since many children become less farsighted as they get older. For most children, the eye crossing resolves or greatly improves as they get older but this usually does not happen until the age of 9-11 years. Some children do not outgrow the glasses and wear glasses or contact lenses as adults. Adults can also consider refractive laser surgery if they remain farsighted. Up to one third of children with crossed eyes will develop a vertical (upward) deviation of one or both eyes. Patching or sometimes surgery may be necessary. Exotropia is when one or both eyes wander outwards. Exotropia is often intermittent and worse while looking at the distance, in sunlight, or when the person is ill or tired. The person may squint one eye closed in sunlight. Sometimes an eye wanders outward because there is something wrong with the vision in the eye, but more often there is no identifiable cause. Amblyopia (lazy eye) can develop as well. The condition can run in families. If there is a vision problem causing the exotropia, then that problem must be addressed. Patching, glasses and surgery are some of the treatments used to correct exotropia. Dr. Patterson performs eye surgery at the Children's Hospital of Wisconsin. Patients who require surgery are provided a packet containing detailed information and websites to help them with their decision to proceed with surgery and to prepare for the surgery. In about 10% of normal newborn babies, the tear duct that drains the tears from the eye to the back of the nose is blocked. It causes the eye to be watery and prone to infections and discharge. Most blocked tear ducts will open up on their own by 6-12 months of age. Some children require a tear duct probing procedure to open the tear duct. Many babies require tear duct massage, washing the eyelids with half strength baby shampoo or topical antibiotics to treat the recurrent infections until the duct opens up. Dr. Patterson will show you a picture of the anatomy of the tear duct system to better understand the massage technique. The blocked tear sac is located on the side of the nose by the inner corner of the eye. Often, this sac is overfilled with tears since it is blocked at the bottom. Gentle but firm pressure using your thumb over the inner corner of the eye and tear sac to massage the blocked tears out helps to prevent infections. If blocked tear ducts do not open by 12-15 months of age or if the infections are severe, Dr. Patterson recommends a probing procedure. The probing procedure is done at the Children’s Hospital outpatient surgery center because the baby will require a brief anesthetic given by an anesthesiologist. A straight, soft metal wire about the size of an earring wire is gently threaded down through the duct from the eyelid to open the blockage. Recent studies have found that most tear ducts will open with a simple probing procedure. Occasionally, the duct is narrow and prone to close again after surgery. It may be necessary to perform further procedures such as balloon dilation or placing silicone tubes to hold the duct open. Pseudostrabismus (false appearance of strabismus) means that although the eyes appear misaligned, they are actually normal and straight. It is often caused by the baby's upper facial appearance. When the bridge of the nose is flat, skin folds partially cover the white of the eyes making the eyes appear crossed in pictures or when the baby is looking to the side. In pseudostrabismus, the light reflex will be in the same location on both pupils. If the child has true strabismus, the light reflexes will be in different locations. Even still, there can be a small amount of strabismus present and this can only be diagnosed upon examination by a pediatric ophthalmologist. There is no treatment necessary because the eyes are not truly crossing. As the child's face matures, the cross-eyed appearance will resolve. Pediatric ophthalmologists have expertise in treating eye muscle problems in children and adults. Many eye muscle problems begin in childhood and when an adult has a similar problem; it is often best treated by someone with that expertise. Dr. Patterson treats adults with strabismus as well as adults with certain genetic eye conditions. Adults with strabismus may have double vision, loss of depth perception, confusion between images, eye fatigue and reading difficulty. They often experience psychological or social problems because of the condition and they may have problems interacting with others or securing employment because of the appearance of their eyes. Strabismus can be treated at any age. Occasionally, eye muscle exercises, prism eyeglasses or botulinum toxin injections can improve certain types of strabismus if the misalignment is slight. Often surgery is required and is done on an outpatient basis. Strabismus surgery involves loosening, tightening or repositioning the muscles to align the eyes. An adjustable suture may be used to fine-tune the end result. Adult strabismus surgery is performed at the Aurora Waukesha surgicenter and other area hospitals. Family doctors and pediatricians are experienced in detecting eye problems in babies and children and will make the most appropriate referral for your child. All children have their eyes examined and screened at each well baby and child visit by their doctor. These vision screens will detect serious eye problems that need a referral to an eye doctor. If you or your family has a history of eye problems that started in childhood (patching, eye surgery, etc. ), then speak with your child’s doctor to see if they need a referral to a pediatric ophthalmologist. 20/20 vision is normal vision and means that at 20 feet you can see what the average person can see from 20 feet. 20/200 vision means that at 20 feet you can see what the average person can see from 200 feet away. Your child’s doctor will recommend an eye exam if the vision screening shows that their vision is less than a certain level. As an example, if the vision is less than 20/40, the Dept. of Motor Vehicles requires that you have your eyes examined by an eye professional before obtaining a license to make sure that you do not have very compromised vision or deteriorating vision. The DMV requires 20/100 vision in the better eye as the minimum vision requirement to obtain a driver's license. They may restrict a driver’s license to requiring glasses to drive, or only allow driving during the day if the vision is poor. The eye is similar to a camera. The front part of the eye and the lens focuses the images we see on the back part of the eye and the retina. If the eye is longer or shorter than average, or if the cornea is shaped differently, the image projected to the retina is blurry. Glasses or contacts allow a clear image to get to the retina. Glasses do not ‘weaken' the eyes. Many people feel they become dependent on the glasses, but your vision without glasses only seems more blurry now that you have become accustomed to seeing clearly with glasses.